Vande Bharat (T18) Ticket Booking Online If you wants to make Safar with Vande Bharat Express Train (T18) than we have good news for you. 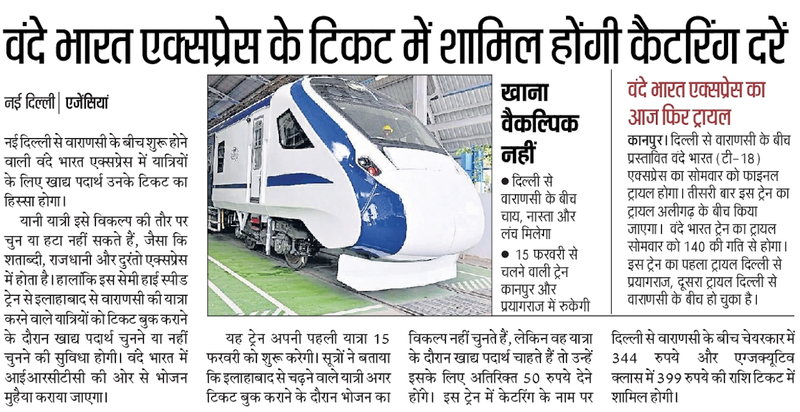 Vande Bharat Express Train which was previously called T 18 is now going to become real from New Delhi to Varanasi Route. New Delhi is the capital city of india and Varanasi is know as Spiritual Capital of India. So T18 become commercial soon in time of Prime Minister Modi Government. For more details check below. Vande Bharat Ticket Booking Online: You need to pay both charges of your T18 Ticket and Food. As per vande bharat latest news of 11 February is Vande Bharat may not charge you food price like airplane free service on food. Railway Food Catering Department of Vande Bharat says: The ticket of vande bharat is included with food for those people who are travelling through vande bharat train. below are important points that we made you to understand on T18 Train Food price. 1. The Catering Rate of Vande Bharat Train from Prayagraj to Varanasi is both Chargeable and Non Chargeable. if you dont want to add food while train booking vande bharata than their is no problem. 2. 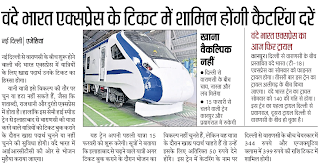 Vande Bharat Train Launching date is 15 February 2019. 3. The minimum price of Vandey bharat Train on Food is Rs 50. 4. IRCTC WILL HADLE Food department of Vande Bharat. 5. In the Name of Catering 344 Rupees is Chargeable to those people who are traveling with chair Car seats. 6. T18 Executive Class food price is Rs 399.